Is TikTok app the next big thing? Definitely, yes! Although many of us are naive regarding TikTok, the app has certainly surprised the best of us by topping the app charts in many parts of the world. Known as Doyin in China, the app is merged with musical.ly and has since become widely popular with the teenage crowds. TikTok is a video-sharing app that allows users to create 15-second videos, add effects, and share with friends. In July 2018, ByteDance – the Chinese company behind TikTok revealed that the app has reached 500 million global active users, surpassing renowned names like Snapchat. 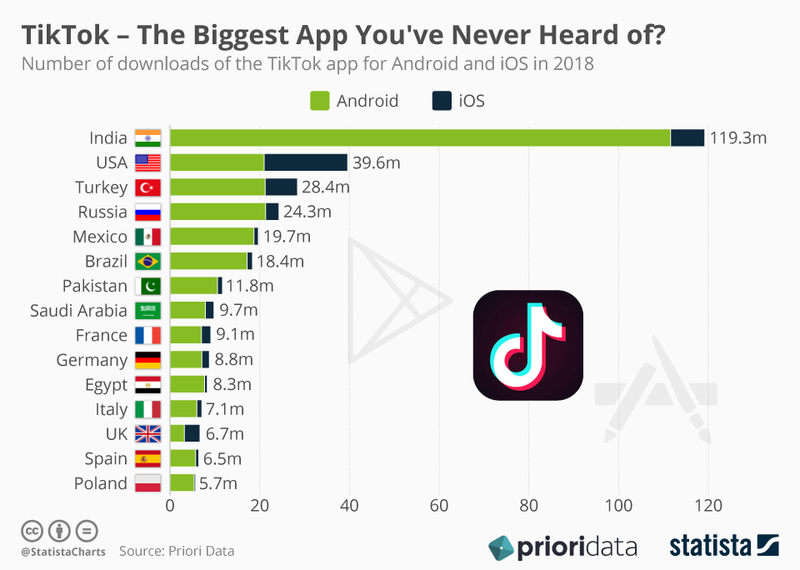 A Statista chart (based on Priori Data insights) also shows that the TikTok app is predominant in India, where it boasts 119.3 million downloads. Other countries such as the USA, Turkey, and Russia are also racking up on the app, boosting its popularity. Seems like the TikTok phenomenon is worth checking out! And if you have not already, download it now and let us know how your interaction with the TikTok app was.